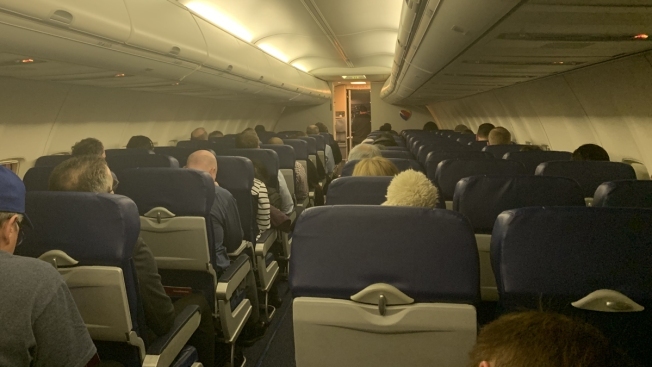 The cabin of an airplane delayed in Chicago by a nationwide server outage on Monday, April 1, 2019. Flights were experiencing delays across the country Monday morning as several airlines dealt with a computer issue. Among the airlines affected were Southwest, United, JetBlue, Alaska and Delta, according to the Federal Aviation Administration. An AeroData computer program that helps airlines plan flights' weight and balance was "experiencing issues," the FAA said in a statement. "Please contact your airline directly for flight information and updates," the agency said on Twitter. Some of the airlines said the issue was resolved. Southwest issued a statement that its ground stop was lifted just after 7 a.m. ET, after about 40 minutes. It said that "an outage with a vendor that services multiple carriers with data used in flight planning" and noted that passengers should anticipate residual flight delays. American said, "Earlier this morning, AeroData had a technical issue that impacted a few of our regional carriers. This technical issue has been resolved. We apologize to our customers for the inconvenience." Delta said a "third-party technology issue" that affected some Delta Connection flights was resolved and that "our teams are working to resolve some resulting delays." More than 650 flights were delayed nationwide by about 8:20 a.m. ET, including one third of flights at airports in New York City, Boston, and Washington, D.C., as well as Chicago's O'Hare International Airport, according FlightAware's MiseryMap. A significant portion of flights in Atlanta, Detroit and Miami were also delayed. It wasn't immediately clear how many delays were due to the outage. Many of the airlines had told passengers who complained about delays on Twitter that they were dealing with a technical issue. Delta said before 7 a.m. ET that it was "experiencing a System-Wide Outage we are working diligently to get it back up and running." Southwest told a Twitter user that tech issues were "affecting our flights system wide."